Location: On corner site, opposite W end of High Street. Former National School dated 1823, and for 150 pupils. It was greatly enlarged to the SW by an addition c1859, by T M Penson, architect. Further blocks were added c1900. The block of 1823 faces NE; 2-storey 3-window with added rendered bay to L. Local brown stone under a slate roof, hipped to L; 2 stone stacks to rear roof pitch. The windows have cambered heads with keystones and hoodmoulds to lower storey, and contain 6-over-6-pane hornless sash glazing, some boarded over on resurvey. Similar cambered head to doorway which is boarded. 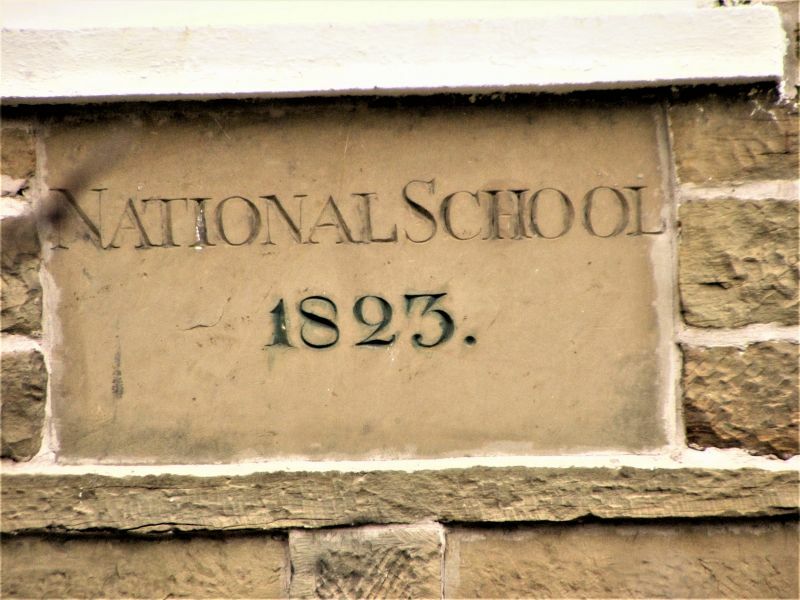 Above the entrance is a datestone inscribed 'National School 1823'. Rendered extension to L has square-headed windows. The SE end has a similar window above a C20 door. This links with a later gabled block to the L which is set back and has a 9-pane sash to 1st floor, and broad C20 window to ground floor. This block adjoins the mid-C19 part of the school which is single-storey, of snecked brown stone under slate roofs with blue brick end stack to R, gablet ventilators in steep roof pitches, and a belfry with pyramidal rooflet to ridge. The main range faces SE and has a large gabled block to the R containing a large 3-light window with square hoodmould. To its L is a narrow projecting gabled range (porch and cloakroom block), which has a 3-light window facing SE, and a doorway in SW side offset to the L. To the L, the range has 2 square headed windows, partly boarded, separated by a lateral stone stack. No openings to SW gable end. The rear of this block has 2 similar windows. At right angles is the former science room of c1900, attached to the main building by lower link and brick cloakroom with blue brick stack to far side. To the L, between science room and 1823 block is a further gabled wing with large 3-light window. No access to interior at time of inspection. In 1996, the 1823 block was recorded as having a central wooden stair with room to each side. Main schoolroom has large L-plan open hall with arch-braced wooden trusses with iron ties, boarded dado, original brick fireplaces. Moveable screen to W end to subdivide. Room to NE has mezzanine floor; to rear, science room has roof ceiled at collar level, glazed brick dado, hopper windows. Listed as an unusual example of an early C19 National School, with mid C19 addition in characteristic Tudor-Gothic style. The stable is to the L of Westminster House and faces E into a small yard. It is a lean-to against the end of no. 11 High Street. A pair of cottages fronting the High Street with Westminster House to the L and Westminster Buildings to the R.
On the S edge of Northop and on a triangular site bound by roads. Reached by a narrow by-road which cuts off the NE angle of the triangle. The farmhouse faces E with shippon to N.
The house fronts the High Street. Near the E end of the High Street, approx 70m from the junction with Northop Road. Set back from the street and facing N.
Located at the E end of the High Street at the junction with Northop Road (A5119). In a prominent position in the village.